My first market is 23 March, 2013 and I am starting to feel nervous and stressed. Do I have enough stock? Will my stock be what the market goers want? Most importantly how will I set up my tables to attract attention to my stall and get sales? I have been going to several markets to research how I set up my market stall. My husband and I have been spending every spare time we have going to the many markets here in Melbourne, VIC... oh and buying too. ;) Here in Melbourne, researching markets is such an easy task. There are so many markets to go to, we are really spoiled for choices. There is never a shortage of markets on the weekends. So, the research is to look at the sellers stalls to work out what I need to do to have a successful experience in selling at the markets. What equipment do I need for my stall? How have they set up their displays? Do the sellers displays attract my attention and make me want to buy? What items on the stall catch my attention? How many items are on the stall? What stalls have similar products? Do I have the same items that other sellers have? Some of the equipment needed for a market stall set up is, a canopy shelter, tables for display, storage boxes, signs, pricing tags, cello bags, shopping bags, pens, sales journal, and most important, a chair to sit on to rest those tired feet. For outdoor markets a canopy of some kind is a must, not only for shelter against the weather conditions but also to create the best lighting conditions. A canopy is not required at indoor markets. One market I went to had a few stalls that were without canopies. That day was a hot sunny day. The combination of sun and display was so bright that the items on display did not stand out very well. One reason for this was the stall holder had bright white table cloths with shiny silver jewelry. In the bright sunlight the combination of white table cloth and silver jewelry was to much for my eyes. I was unable to see the items on display well enough to make a good judgment on what I liked. So, a canopy not only protects against the weather it helps keep the lighting levels down in the bright sunlight. We decided on a 3m x3m canopy with solid side wall at the back. The back side walls help maximize the lighting, keep the wind from blowing your items around, and a great way to provide shade on hot sunny days. Canopies can be bought at any outdoor shop. The one we finally settled on was the Spinifex. Our decision was based on how sturdy the canopy was, as we also want to use the canopy on family camping outings. The number of tables and the size of the tables at markets seem to vary. I did notice that most stalls had at least two 2m tables for displaying their items. Until I have done a couple of markets, I am going to stick with one 2m table and another table that is slightly smaller, a 4' table we bought at Officeworks. One requirement for tables that my husband and I thought was important is that the tables should be folding tables for easy transport. A nice addition to each table is a table cloth to "pretty up" the display. I have seen black table cloths and white table cloths. I have not made up my mind which to use. I know that black in a climate like Australia can make the table a bit hot, but under a shelter there should be enough shade to keep the table from being to hot. I think the black cloth helps things like jewelry and white items stand out much better but white makes the items appear bright and cheery. I am at an empass.... think I may buy both and see how it works for my displays. You can never have enough boxes! I have spent the last two months making items for the market, and I seem to have filled at least 3 small storage containers with stuff. The larger ones I will fill with light items so I can lift them on the day, the smaller ones I am filling with labels, business cards, and shopping bags. One very important box I will need to purchase for the stall is a lockable box for money storage. 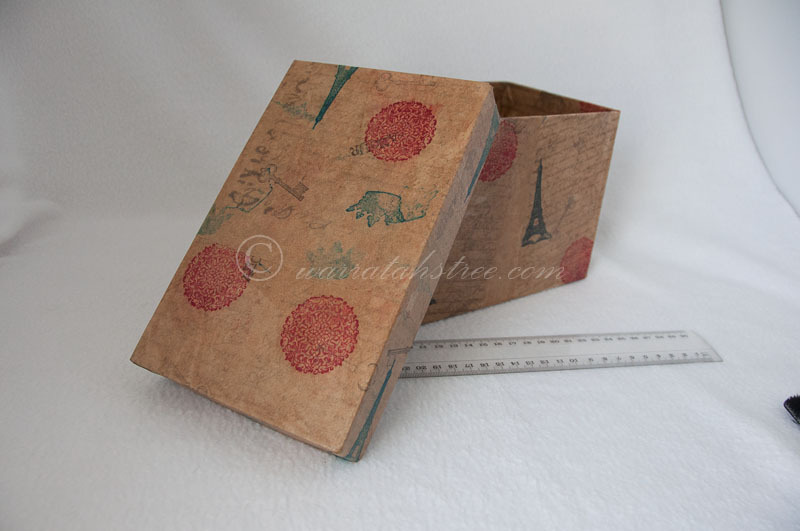 I have made my own box for business cards, earring cards and Stamp class invitations. I used a template I found on the Stampin Up! demonstrator's site and altered it to suit my use. The paper is miss-matched lol, I just used some scrapbook paper I had on hand at the time. I am working on some display boxes for cards and jewelry display. Here is a card display box for the market stall. I created it using the brown packing paper that comes with my Stampin Up! order and used Mod Podge to attach and seal the paper to the box. The stamp set I used for the stamped images is a Stampin Up! set called "Artists Etchings". I love the vintage inspired look of the stampset. It is also a stamp set that can be used to create some Cottage Chic/Shabby Chic inspired cards. Most of the stalls have signs denoting the business name, pricing of items, sales, and some product advertising. As this is my first market stall, I am going to just printout my business sign on paper and laminate it. I am not sure how we will attach it to the canopy as yet, but I am sure a bit of duct tape strategically placed will do the trick, lol. DH has suggested I attach velcro to the canopy and use velcro to attach my business sign. One thing I did notice is that business signs on canopies tend to get over looked and signs that have been attached to the tablecloths or placed on the tables of the stall are more visible. I am planning on having one sign on my stall and another on the main table. My business is called Warratahstree and I have just the photo to use as my main display. Other signs stall holders have on their stalls are signs that show the pricing for items but one stall i went to I noticed that there were items on the table that I had not idea what they were used for and did not notice a sign telling me what the items were. It was fun asking, it was a wedding stall and the item was a ring pillow, differently shaped and in asian fabric. Pricing signs...well, I am not one that likes to ask what the price is for an item. If I have to ask then I always seem disappointed when they price is more than I want to pay. Prices should be clearly marked. Some of the stalls had their items evenly priced, i.e. girls neckalces for $7.00. I am pinning this. Thank you so much for joining Pin It Monday Hop. Followed you via Feedly. Please come back sometime if you get a chance. Oh one more thing have you linked at Linkin with my Ladies Blog hop? Here's the link if you haven't done yet. You'll get to expose your blog to other bloggers too. Have a nice day Tracy! added you in G+ too. Just stopping by from the Friend Connect Blog Hop. Your blog is so lovely. That box that you made looks gorgeous! I love anything with a Parisian theme and actually collect storage boxes. I now follow your blog via GFC and I look forward to reading your future posts. Thanks for stopping by my blog. I got the idea to do Paris themed cards and items from a friend of mine who went to Paris and fell in love with anything Paris. BTW your blogspot link above has been removed? Thank you so much for joining Pin It Monday Hop#1 Where you pin and get pinned (LINK). Please come back on Sunday at 5pm (CST)for our Pin It Monday Hop#2. Pinned this to our Pin Board. You might want to view the 10 featured projects from Pin it Monday Hop#1 (link). Have a nice day!